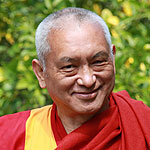 Lama Zopa Rinpoche is the recognized reincarnation of the great Tibetan Buddhist yogi Kunsang Yeshe, the Lawudo Lama. Rinpoche was born in 1946 in the Mount Everest region of Nepal, where his predecessor meditated for the last twenty years of his life. At the age of ten, Rinpoche went to Tibet to study and meditate. The Chinese occupation in 1959 forced him to seek safety in a Tibetan refugee camp in North India. It was at Buxa Duar that Rinpoche became the disciple of Geshe Rabten Rinpoche and then of Lama Thubten Yeshe. Lama Zopa Rinpoche’s contact with Westerners began in 1965 in Darjeeling, and in 1969 Lama Yeshe and Lama Zopa Rinpoche founded the Nepal Mahayana Gompa Center at Kopan, above Boudhnath Stupa in Kathmandu, Nepal. In 1971 Rinpoche took gelong ordination from His Holiness Ling Rinpoche in Bodh Gaya. By 1975, twelve centers had started. In 1976, the growing worldwide organization was named by Lama Yeshe ‘the Foundation for the Preservation of the Mahayana Tradition’ (FPMT). Rinpoche is now the Spiritual Director of the Foundation for the Preservation of the Mahayana Tradition. Rinpoche teaches Tibetan Buddhist philosophy and practice all over the world and is the author of several popular books. Under Rinpoche’s direction there are now more than 160 FPMT centers, projects and services around the world. Rinpoche has initiated many other projects around the world; one of the most important is the 500ft Maitreya Statue that is being built in India, and will include schools, hospitals and other social projects. Khen Rinpoche Geshe Thubten Chonyi was born in Nepal in 1962, Khen Rinpoche joined Kopan Monastery after being ordained by Lama Zopa Rinpoche in 1974. 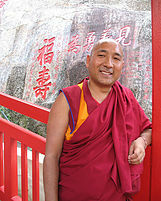 After 18 years of intensive study and debate in Sera Je Monastery in south India, Khen Rinpoche was awarded the title of Geshe Lharampa, the highest Tibetan Buddhist doctorate conferred in the Gelug monastic tradition. After completing his education at Sera Je, Khen Rinpoche joined Gyudmed Tantric College for one year where he furthered his studies on tantra. The Gyudmed monastery is one of the two key monastic colleges in the Gelug tradition that specializes in the teachings of Buddhist tantra. Khen Rinpoche again excelled in his studies there and was awarded first position in his class. Khen Rinpoche Geshe Thubten Chonyi has been the resident teacher of Amitabha Buddhist Centre, Singapore since 1999 and he was appointed as the Abbot of Kopan Monastery and Nunnery in Nepal on 14 July 2011 and joined the FPMT Board of Directors in 2011. ​​In 2001 he was sent by Lama Zopa Rinpoche to New Mexico, USA to serve and help at FPMT International Office and also to teach at the FPMT center and study group in New Mexico. He also served as a member of the FPMT Inc. board member for 2 years during that period.​ At the end of 2003 he returned to Nepal to do retreat. In 2006 he was appointed as Headmaster of Kopan Monastery, and served in that capacity for 4 years. He served at as acting Abbot for a year in 2011 when Khensur Rinpoche Lama Lhundup became ill.
​​Geshe Sherab is currently resident geshe at Thubten Norbu Ling, New Mexico, USA. He also regularly teaches at other FPMT centers around the world. He joined the board of FPMT Inc. in 2018. Venerable Roger Kunsang became a Buddhist monk in the Tibetan Gelug tradition in 1975 at the age of 26. He has continuously served the FPMT in various roles since 1974. For the first seven years of his ordination he lived mainly in Asia where he studied and practiced Buddhism. Following this he was founder, director and resident teacher of the FPMT center Vajrayana Institute in Sydney, Australia for four years. In 1986, Ven Roger became the full-time attendant and secretary to Lama Zopa Rinpoche, FPMT’s Spiritual Director, and he continues to serve as Rinpoche’s assistant to this day, helping maintain the connection between the Spiritual Director and the whole FPMT organization. 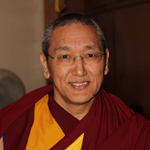 Ven Roger Kunsang has been a member of the FPMT Board of Directors since 1989. In 2005, Ven Roger Kunsang became Chief Executive Officer (CEO) of FPMT Inc. As CEO, his main responsibilities are to ensure that the organization achieves its mission under the direction of Lama Zopa Rinpoche and its founder Lama Yeshe. Andrew Haynes graduated in Systems and Management from City University in London, England. In 1983, Andrew moved to Italy where he studied Buddhist philosophy at Istituto Lama Tzong Khapa. From 1986 to 1989 he was Director of the Institute. In 1990, he returned to London where he pursued careers in local government and software development. 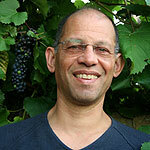 Andrew was Chair of the Board of Trustees of Jamyang Buddhist Centre, London for ten years. He currently works as a software developer for a major media and telecoms company. Andrew has extensive experience with the third sector including setting up an educational charity. Rasmus Hougaard joined the board in March 2016. He is the director of the Potential Project, which is a Foundation for Developing Compassion and Wisdom-recognized program. 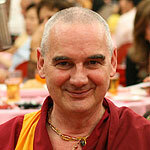 Previously Rasmus was director of the FPMT center Tong-nyi Nying-je Ling in Copenhagen, Denmark.